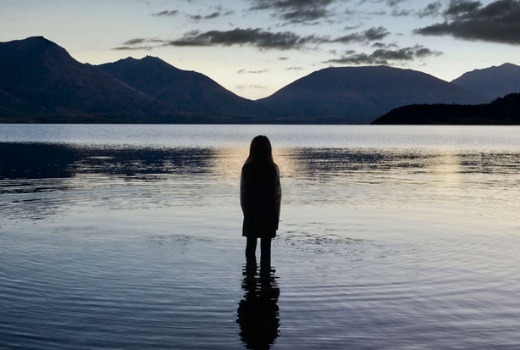 I’ve been waiting for some time to show you the trailer for Top of the Lake, Jane Campion’s miniseries coming to UKTV in March. I first saw this at the SPAA Conference and was mightily impressed. It has finally been released so I can bring it to you. Clearly this draws upon Campion’s evocative visual style, but I sure hope it lives up to this trailer. Starring Elisabeth Moss, David Wenham, Peter Mullan, Tom Wright and Holly Hunter, Top of the Lake is a powerful and haunting mystery. Set against a vast, varied terrain – moody, pure and remote – Top of the Lake is a story about our search for happiness, where the dream of paradise attracts its dark twin, the fall. Twelve year old Tui Mitcham, daughter of the local drug lord, is pulled from the freezing waters of an alpine lake in New Zealand. She is discovered to be pregnant and won’t say who the father is. Then she disappears. Robin Griffin is the straight-talking detective experienced in child protection who is called in to investigate. But as Robin becomes more and more obsessed with the search for Tui, she begins to realise that finding the girl is tantamount to finding herself – a self she has kept well-hidden. Top of the Lake will be screening at the upcoming Sundance Film Festival. It is the first time that the prestigious festival has included a scripted long-form series in their line-up. Genevieve Lemon (Sweetie), Robyn Nevin – doyenne of Australian Theatre, Robyn Malcolm (Outrageous Fortune, Rake), Jay Ryan (Offspring, Go Girls) Kip Chapman (The Cult) and Madeleine Sami (Super City) are among a host of Australian and New Zealand talent to feature in the production. Top of the Lake from See-Saw Films is co-produced by BBC Two in the UK, UKTV in Australia and Sundance Channel in the United States. The series is co-written by Jane Campion and Gerard Lee and co-directed by Campion and rising Australian director Garth Davis. The executive producers are Jane Campion, Academy Award® winners Emile Sherman and Iain Canning (The King’s Speech, Shame) of See-Saw Films, and the producer is Philippa Campbell (Rain, Black Sheep) of Escapade Pictures. Screen Australia and Screen NSW provided investment with Fulcrum Media Finance funding the New Zealand Screen Production Incentive Fund (SPIF) and the Australian Producer Offset. UKTV from Sunday, March 24 at 8.30pm. Saw the trailer on UKTV last week and just seeing the names of the actors got me excited. Really looking forward to seeing this.